It’s been a while since we last saw King Diamond in the Netherlands. Of course, the master of metallic horror has been out of the game for quite a while, following back pains and finally multiple heart attacks back in 2010. Last year though, King finally made a triumphant return to the stage, frequenting the bigger festivals out there and apparently making a huge impression. An appearance in a Dutch venue was also long overdue, and August 6th saw King finally return to the stage in the Lowlands (not counting the Belgian Graspop festival), in a quite fully packed 013 in Tilburg. Now, first thing’s first: the crowd was promised a three hour show, as advertised on the venue’s website weeks beforehand, and there would be no support act due to the length and the size of the show. A statement which was strangely enough retracted a mere few hours before the concert. King, was said, would play his standard 90 minute set, and there would still be no supporting act, because the stage production was too elaborate. When the lights dim at exactly eight-thirty, yes, the stage looks good, with its glow-in-the-dark pentagram, candles, gothic stairs and a nice castle-y backdrop. 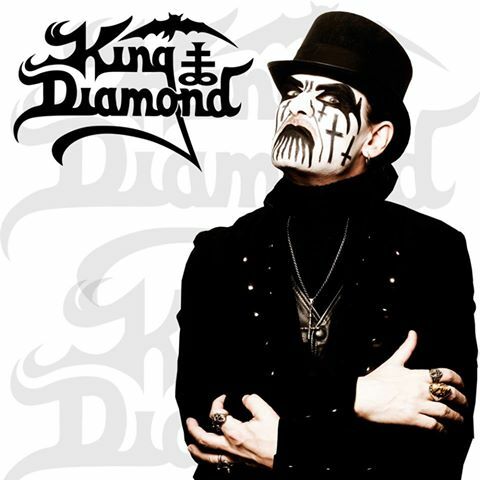 And of course, the big fence that has been a trademark for King Diamond shows for such a long time. I have seen more elaborate stage setups where they had bands supporting, just saying. From the opening notes of The Candle, however, the fans are treated to ninety minutes of traditional heavy metal excellence, and in the end, perhaps that’s what matters most. The King himself is in excellent vocal shape tonight, and sounds even better than I expected. At a venerable age of 57, the man still sounds great, and hits most of the high notes of old. The same goes for the excellent backing band tonight, who do a more than admirable job of recreating the classic songs in King’s oeuvre. And it’s a classic set, indeed (and not only because the last studio album, Give Me Your Soul…Please, is from 2007), and a trip down memory lane if there ever was one, with older material like The Family Ghost and Welcome Home finding their place amongst relatively newer songs like Up from the Grave. Also present is the myriad of theatrics, with most of the songs featuring a female dancer, well, dancing, or lighting incense, whilst King himself sports a shovel during Up from the Grave. There’s something to see as well as to hear, and that’s always a plus at any concert. In the end though, with small pauses and interludes littered throughout the set, you leave the venue feeling you have missed something. When you more or less get your first encores after the one hour mark, you can’t help but feel a little cheated at the suddenly quite steep price of thirty euros. If they had thrown in one or two other bands into the package – and there are more than enough bands who’d open for someone like King Diamond for free – there’d be a much better sense of balance to the evening, and Mercyful Fate classics like Evil and Come to the Sabbath can’t change that, sadly. Neither can a half-baked drum solo (if you already have little time, at least make sure it’s a good solo spot). I had a brilliant time, but that’s only because of the years of hiatus. Still, long live the King. This entry was posted in RP and tagged 013, King Diamond, Live review, Mercyful Fate. Bookmark the permalink.